A mother who broke almost every bone in her body in a horror car crash has spoken today of how her five-month-old daughter miraculously escaped the collision without a scratch. Lisa-Marie Stoneley, 34, suffered a catalogue of devastating injuries and was left in a coma for eight days after the car in which her family travelled home from a carnival hit another car head on. But despite being left in a wheelchair and unable to go back to work, Lisa-Marie says that she just wants to focus on the fact that her family all survived. 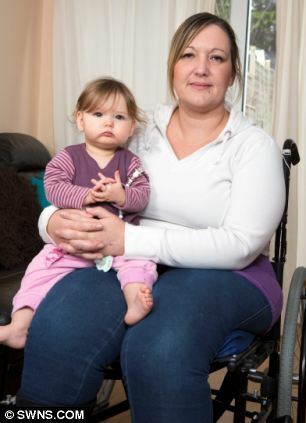 The mother-of-two, who said she had ‘too many broken bones to count’, broke both legs, fractured her spine and several ribs, cracked an elbow, shattered her pelvis and ripped cartilage in both knees in the crash on the B3168 at Bay Hill, Somerset in October.